Declan O’ Carroll, with the winners of the Harley McDonagh trophy for the third year in a row, Welchtown N.S., Ballybofey. 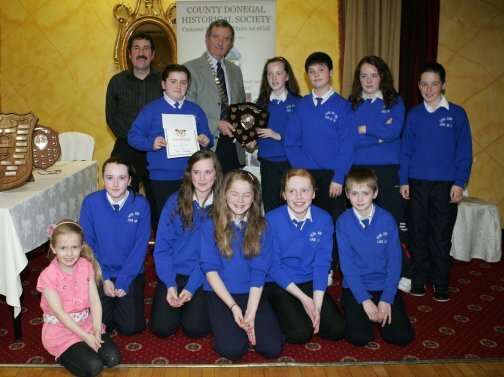 Kilaghtee N.S., runners up in the Harley McDonagh competition. 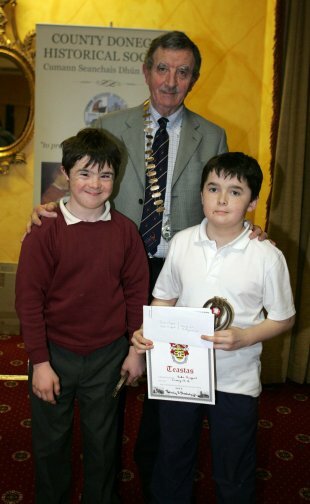 Scoil Eoin-Pol, Loch an Iuir, runners up in the Harley McDonagh competition with Pat Shallow and Declan O’ Carroll. 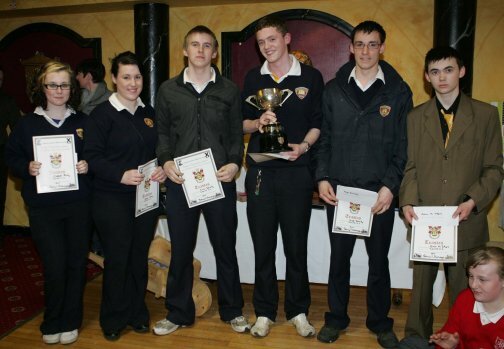 Colaiste Phobail Cholmcille, Tory island, winners of the Fr. Jackie Fitgerald trophy. Also in picture are Declan O’ Carroll, President, and May Kelly-Fitzgerald, sister of Fr. Jackie. 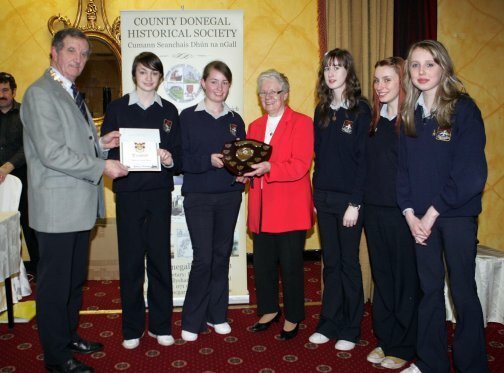 Students from Pobalscoil Ghaoth Dobhair, runners up in the Fr. Fitzgerald competition. Also in picture are Declan O’Carroll, society president and May Kelly – Fitzgerald. Cecil King Cup winner, Jordain Cunningham, Carrick Vocational school, with runners up; Lauren Jones, Clodagh Brady, Chris Doherty, Hugh Doherty and Adam McIntyre, all students from Carrick V.S. Winner: Ellen Nugent, winner of the individual award, with Society President, Declan O’ Carroll. 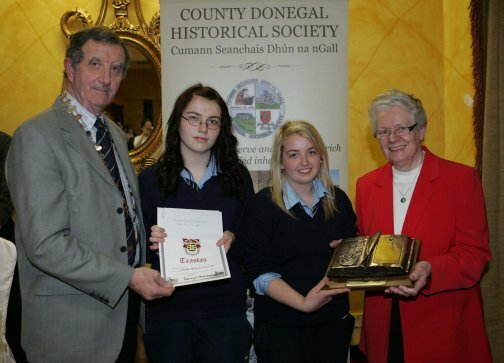 The 38th annual schools history competition organised by the County Donegal Historical Society took place in Jackson’s hotel, Ballybofey on March 30th. As usual it was a night of colour and enthusiasm with some amazing projects, displays and presentations. It wasn’t easy for the many schools who expressed an interest, to get to the finish line this year, with weather and all sorts of obstacles getting in the way. However those who did produce finished projects warmed all our hearts with the quality and effort involved. The themes were: Lighthouses, Donegal Industry 1920-1980 and Rural Electrification. 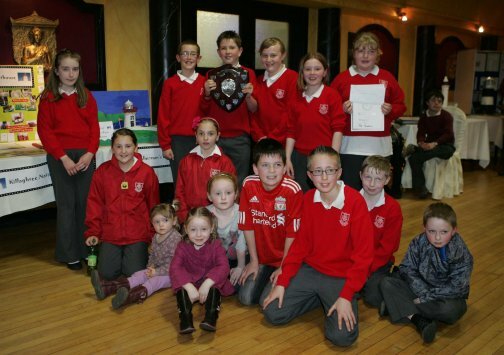 In the primary schools section Kilaghtee N.S., Dunkineely, Scoil Eoin-Pol, Loch an Iuir and Welchtown N.S., Ballybofey produced tremendous entries. Welchtown N.S. achieved a hat trick of successes, a feat rarely achieved in the long history of this competition. In the second level section, Pobalscoil Ghaoth Dobhair and Colaiste Cholmcille, Toraigh fought it out for the Father Jackie Fitzgerald trophy, with the Toraigh crew emerging as victors. The Nugent family from Ballyshannon (Ellen, James and Jude), are loyal supporters of the competition and provide exceptional entries each year. 2011 did not disappoint and as well as winning individual and small group awards, they were honoured with the Emerson trophy for their outstanding contribution to this competition. They were joined in the small groups section by three young ladies from St. Mary’s N.S., Malin Head, Aoife Walsh, Megan Toland and Siobhan Farren, with their project on Lighthouses, which included a working model. As always Carrick Vocational School under the guidance of Noel Ward produced some excellent reproductions of various historical artefacts, with Jourdain Cunningham taking the Cecil King Cup for his Celtic Harp. The Fitzgerald Trust is the sponsor of these competitions and provides funds for the trophies, certificates and cash prizes. Fr. Jackie’s sister may and husband Brian were in attendance as usual and may presented the trophy. 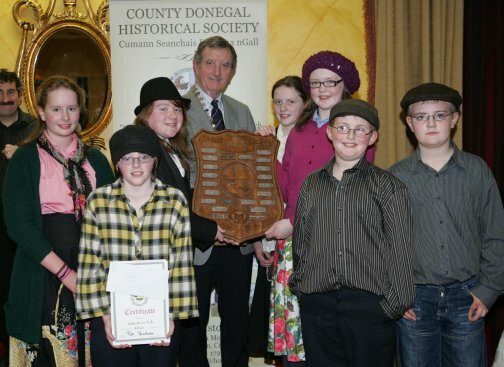 Father Jackie was a great soldier in the cause of Donegal history and his memory lives on in the efforts of these young historians of the future and their teachers and parents. The thanks of the committee are warmly extended to our president, Declan O’Carroll, secretary, Una McGarrigle and the hard-working judging team of Helen Meehan and Aine Ni Dhuibhne. Winner: Colaiste Phobail Cholmcille, Toraigh. Primary: Joint Winners: James & Jude Nugent, Creevy N.S., Ballyshannon. Aoife Walsh, Megan Toland & Siobhan Farren, St. Mary’s N.S., Malin Head. 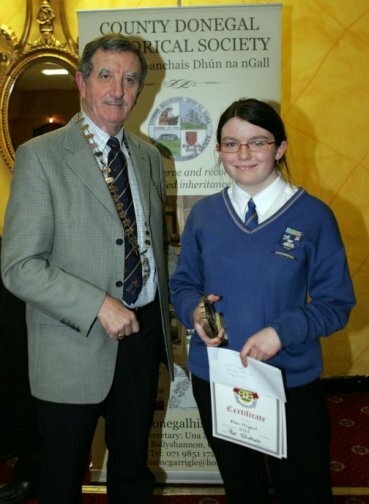 : Ellen Nugent, Colaiste Cholmcille, Ballyshannon.